A flipflop hub is a rear hub for a fixed wheel bike that has a gear cog on each side of the wheel. Back in the Jurassic period of cycling, before the invention of derailleur gears (and long before the bicycle gear calculator existed) this was a sneaky way to turn a single speed bike into a two speed bike. All the rider has to do is stop when the gradient of each hill becomes too steep, take off the wheel and turn it around so the chain now runs on the other cog. Cunning stunts huh! If you don't want to also have to add or remove chain link(s) at the side of the road then: The limit on the difference between the number of teeth on the small side (flop side?) and the number of teeth on the big side (flip?) is determined by the amount of adjustment available to tension the chain. A Bicycle frame permits a minimum chainstay length of 17 inch, and allows 1 1/4 (1.25) inches of adjustment giving a maximum possible chainstay length of 18.25 inches. I want my lowest gear to use a 50T front with a 28T rear and I want to know what is the smallest gear cog that I can put on the other side of the bikes flipflop hub. Step 2: Open a second instance of the calculator (or just change the values). Enter a chainstay length of 18 inches. This is 1/4 inch shorter than my 18.25 inch max to allow for the fact that as the chain and sprockets wear further adjustments will be required to take out the extra slack that will be created in the chain... Use the spin buttons to decrease the rear cog value until the recommended chain length is 54 links new chainstay length is no more than 18 inches. 21 teeth gives a new chainsty length of 17.9 inch and should be okay. Pushing things a bit you could probably get away with 20 teeth but this will leave bit less than 1/4 inch of adjustment to compensate for wear in the chain and sprockets. 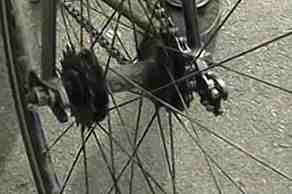 I could swap my 28T cog for 29T and still use a 54 link chain without running out of forwards adjustment. I can use a 21 tooth cog and still have more than 1/4 inch of adjustment to allow for wear. 19 teeth is just about possible with a brand new chain and sprockets but only allows an inadequate 0.05" of adjustment.